We just got a new roof and it turned out that our hall skylight needed parts that couldn’t be found. We had never used the skylight anyway. We’d always covered it with fabric because we found it to be too harsh and glaring. It was a pretty big one, about 44″ by 16″ –not one of those little portholes. What to do. It was actually an easy decision. Cover the skylight hole with the new roof. But then we have this big “well” in the ceiling. I didn’t know what else to call it since ceilings don’t usually have “holes” up to the roof. Anyway, “ceiling well” seemed as good a descriptor as any. Initially we decided to just have the hole insulated appropriately and add ceiling board and texture. Although this is not a bad solution, it wasn’t a beautiful one. It wasn’t interesting and it was boring. We decided to put a mobile in the well. Add power, lights, fans, whatever it would take to highlight it. We found a wonderful mobile that delights us every time we walk through the hall. It’s lighted itself and we only had to add a small fan to keep it active. I bet you’d like to see it. I couldn’t resist shooting it day and night, as it gets more dramatic as the daylight wanes. Now isn’t that a LOT better than an old glaring skylight? If you haven’t already upgraded to the latest version of Ez-Architect, it’s time to do so. Back up all of your plans to a different location on your computer (and make an external backup if you don’t already have one). Back up any and all of your custom Library objects to a different location (and also make an external backup of these). Install Ez-Architect 5 as administrator. Enter your new Ez-Architect 5 key. Ez-Architect 4 keys will not work with Ez-Architect 5. You cannot keep two different versions of the program on the same computer. If you haven’t already upgraded, you need your Ez-Architect 4 key to get the special upgrade price. Start here to enter your key and proceed to the upgrade order form. If you have lost your Ez-Architect key, start here to fill in the Ez-Architect retrieval request form. Please provide all the details to help us more easily find your old key. THIS TIME, print out your order ON PAPER and store it where you can find it along with a copy of the downloaded file (for that time when you get a new drive, or a new computer–you’ll have everything you need to re-install). For the feature details of Ez-Architect 5, look here. 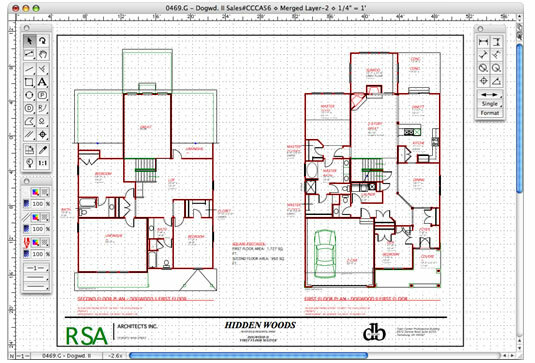 If you are a professional using Ez-Architect to draw plans for your clients, or you’re just proud of your personal Ez-Architect plan and want to embellish it with your own special logo or mark, you can easily do this with Ez-Architect. Depending on the size and resolution of your logo, you may have to re-size it in Ez-Architect after pasting. I just did a test and mine came in HUGE. But it’s easy to change its size, even if you can’t find the handles. Click Object Properties under Options. Click on the Change Dimensions button. Take note of the current Aspect Ratio. Ballpark numbers will do. Change the two dimensions so that your object will be smaller on the screen. Click OK and your object will be smaller. Use the handles or use object properties again to size appropriately. This may be a cleaner way to get your logo into your drawing. Use the Library Tool. You can import any just about any image type into your drawings with the Library Tool. Ez-Architect is very dynamic when it comes to layers. You can enable them, disable them, look at any number of them at once (enabled and/or disabled). You may get confused at times if you are looking at more than one Ez-Architect layer and trying to move an object that you can see, but is on a disabled layer. You may think that something crazy is happening. It’s not. We suggest that before you work with layers on a detailed plan, that you play with layers. Enable several layers and give them useful names. Then start placing objects of each of them. Disable some, but still view them and see what happens when you try to select something on a disabled layer. Look at the base layer and see what happens when you move something on a disabled layer. What happens when you try to move it when looking at that disabled layer along with one that’s enabled. The function is very dynamic, but can be confusing when you first use it. Have fun with it while you’re learning. 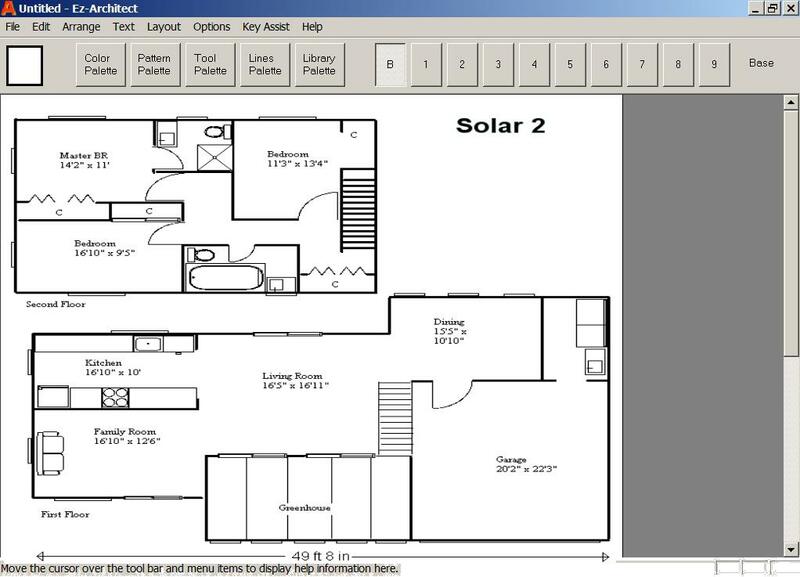 You’ll find it very useful when you create your floor plans and house plans. We have had suggestions for making layers even more dynamic including being able to reorder them. All suggestions are welcome–for layers or other parts of the program–as it does get updated to new versions fairly regularly. So let us know your ideas. We have an add on module for Ez-Architect that adds dozens of home and office library objects to your Ez-Architect library resources. A unique feature of these objects is their 2½-D quality. 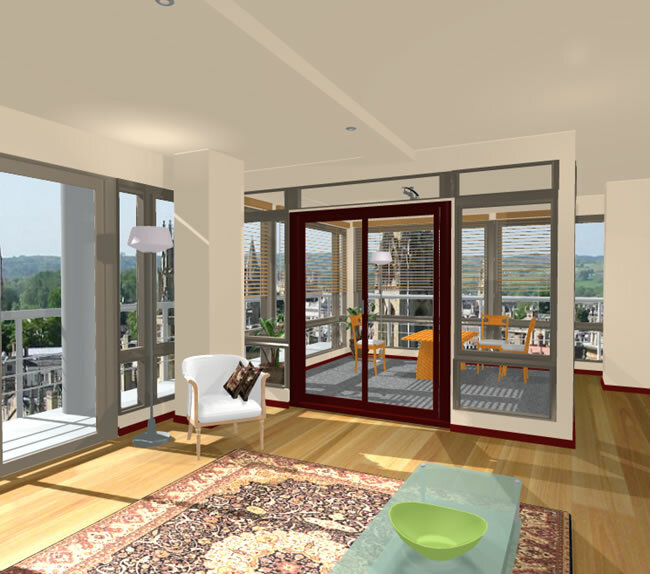 Many of them will enable you to make 3-D simulations of your plans. And a special template will assist you if you want to draw your own 2½-D objects. Not true 3-D, so we call it 2½-D. The library download is a file that you simply unzip and place in a convient directory. Some folks have tried to install this as a program. But it’s basically a data set that just needs to be unzipped into its own directory. First be sure you know the default location where your downloads land — this might be on your desktop or in a directory called Downloads. This default location is handled by your browser. If you’re not sure, look in your browser defaults/options to find the name and path of your default download directory to identify the download location. Of course you can put the library anywhere on your computer that you wish. However, we suggest putting it just beneath the included library so that it’s easily accessible when you’re ready to add library objects. The program defaults to the Library directory, so your Home-Office-Library is only one click away. We often have new versions and updates for Ez-Architect. These are not always free and new ones will not usually work with your “old” key. We don’t make old version downloads available either (although they can be found at some download sites). That would cause mass confusion at our site. We usually require an old key to get an upgrade for a reduced price, and we always have many folks filling out the “I lost my key” form so WE can search for their key. Then there’s the computer/hard drive failure and the new computer. YES, everyone’s hard drive fails eventually, and all of us are eager for that next new machine. But oh no! We lost our key and our download files because we didn’t back up or save the file externally to our machine. Here’s the thing. If you bought software in a box, you would carefully shelve it along with any special keys you need to make it operate. Why would you treat downloaded software any differently? Especially software you paid for. You bought it, you got a file and a key. Why aren’t these worth safeguarding? So back up Ez-Architect on a CD or two AND write the key or print the email with the key and keep it with the CD. Label the CD with the version number and write the key on the CD, too. So when you get a new machine or your drive fails, you’ll be able to reinstall your version without a problem. And when you’re ready to upgrade, you’ll have the key for that, too. We’ll hunt for your key and hopefully find it for you. No guarantees about that (the hunt can sometimes be a challenge). We aim to keep our admin time low so we can keep our prices low. You know the deal. More admin time >> higher prices. Here’s a new dialog that will appear in future versions. You’ll see it after you enter your key. Please read the following and follow the instructions to insure your ongoing use of this software. 1. Print or write down your key and put it ON PAPER where you can find it. 2. Make a backup of the install (zip) file that you downloaded and store it on a CD and a Flash drive or on two CDs with another copy of your key. Store them thoughtfully and label them with details. We have frequent updates and a variety of versions of this software. If you lose your download we cannot guarantee that you can get that version again. If you lose your key we cannot guarantee that we can find it again for you. Your computer and/or hard drive will crash eventually (they all do); or you will get a new computer (eventually we all do). You’ll need to reinstall the program on your new drive or new computer. You’ll need this key and the version you just downloaded. So be happy and be responsible for your purchase. Thank you. If you’ve purchased Ez-Architect’s full version, you’ll get an email with the key and a fairly long download link. It’ll probably show up in two lines in your email. Anyway, never fear. That download link is for the same file as the demo we provide before you buy. If your link doesn’t work, just wander here and get the demo download any time, but note the very important info in my next post. 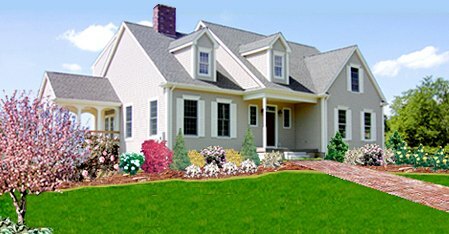 You are currently browsing the Home Design Software, Etcetera blog archives for August, 2011.